I’m having lunch at Cafe Tintin Tango. 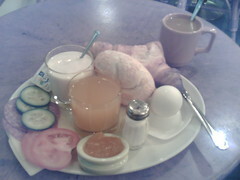 It’s a great refuge on this windy & rainy day, and their all-day breakfasts are an old favourite of mine. 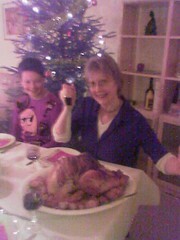 We had our usual English Christmas dinner at our place on Christmas Day. 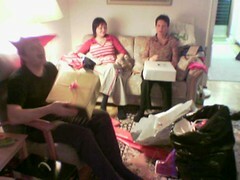 It’s handy to be able to have the family Christmas on Christmas Eve and the ‘friends’ Christmas on Christmas Day. 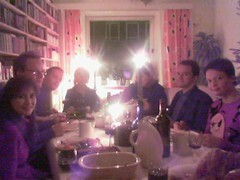 From left: Marika, Niklas, Jyjy, Eve, Soili, James & Tiina. Cindy strikes a dramatic pose with the turkey. 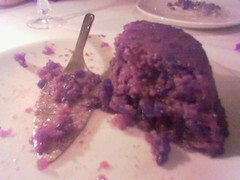 The Christmas pudding came out just fine – very juicy, very fruity and rather alcoholic! 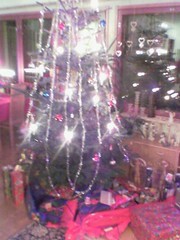 In Finland we celebrate Christmas on Christmas Eve. Eve & I joined her family at her mother Airi’s place. Here’s Eve’s mother’s Christmas tree. 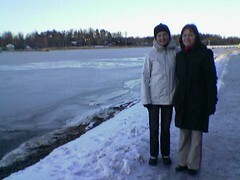 Eve, Tiina & I went for a brief walk beside Vartiokylänlahti, which Eve’s mother’s home overlooks. It was a lovely day. 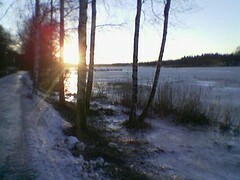 In Finland in winter the sun never gets very high in the sky, and views like this of the sun through the trees are typical. We bought our Christmas tree at Hakaniemi market square a couple of days before the party. The tree seller was probably the first of the season, and obviously not a professional but just someone who had some land with trees on it. 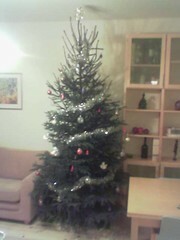 But ours is a nice tree and fits the room rather well – I just had to trim the top 20cm off the top to make it fit. Eve did all the decorating – I just did the heavy lifting taking it home and installing it in its stand. 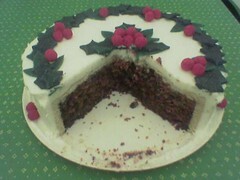 So after all the effort, here’s the finished Christmas cake. It’s nearly a foot across, and extremely heavy. The icing is “royal icing”, and the holly & ivy decorations are made from marzipan – they took a while to do, but came out very satisfyingly. More importantly, the cake tastes good too! 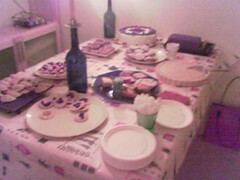 Last Saturday Eve & I had our ‘pikkujoulu’, i.e. Christmas party. About 20 guests came, and we had a very enjoyable time. So enjoyable in fact that I forgot to take any photos, apart from this one of the table of food we’d spent the previous day and several evenings cooking. There were various savoury mini-pasties etc., Christmas cake, mince pies, shortbread, rum butter tarts and old English egg nog tart. The mulled wine was a great success: we made about 9 litres and it all went by the end of the evening. This is Helsinki’s south harbour, last Friday evening. 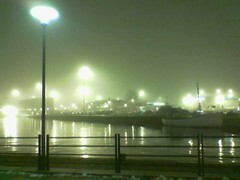 There was a thick mist, and the harbour lights glowed blurrily through it. On Monday 6th December Eve & I went to the Design Forum Christmas fair, where lots of small craft and design companies had stalls selling their products. Our friend Isabella Haas invited us to drop in on her at the Secco stall. 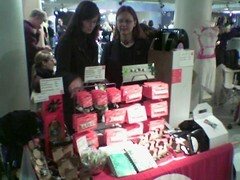 Here’s the Secco stall. Isabella is on the right. Here’s a closer look at Secco’s products. 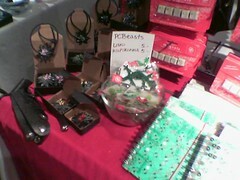 They’re all made from recycled materials; for instance the star-shaped necklace pendants are made from used tyre rubber, and the letter fridge magnets are old computer keyboard keys. 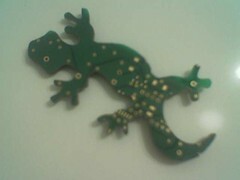 My favourite Secco product is their lizard fridge magnet, part of their PC Beasts range, made from computer circuit board. This one is on our fridge at home; I have another on my whiteboard in my office at work. Monday 6th December is Finland’s independence day, and a public holiday. So on Sunday 5th we went to Scott & Séverine’s for an extra-long board games event. Michael was keen to use the chance to play a very long game, whereas I just relished the chance to play more normal-length games. 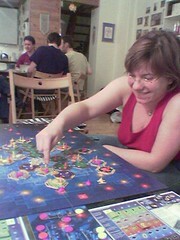 Séverine playing Nautilus. This was a rather fun game, exploring a reef by placing tiles to build a habitat and moving mini-subs. Bas et al playing Dune. 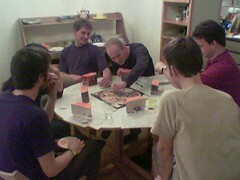 Including the time it took them to figure out the rules, the game took 10 hours! 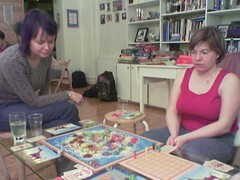 Eve & Séverine playing Evo. Apart from always getting confused about the direction of the seasons’ effects, we always enjoy this game. 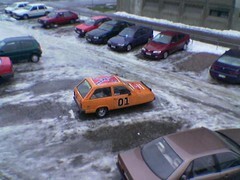 This Reliant Robin has been painted in the style of the “General Lee” from the TV show “The Dukes of Hazzard”. It was parked in an appartment car park near our flat.